Big Bucks can’t stay away from Nutra Deer POWER PUNCH attractants. 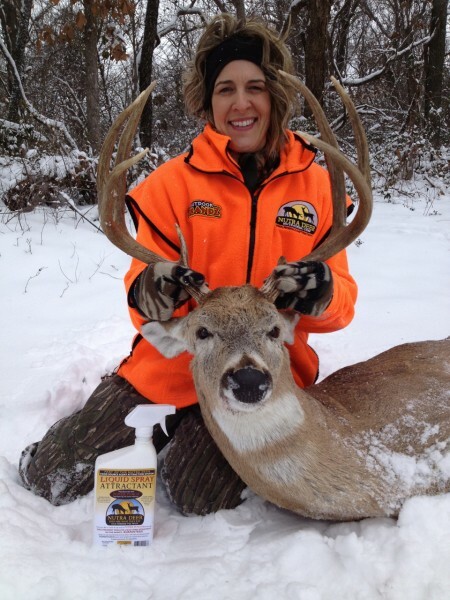 Patricia Williams Owner of Outdoor BrandZ and the story of her first deer! I just wanted to share a great little story with you about a deer my kids named “PUNKIN” (Round Rack) in 2011. We first saw Punkin in Dec. 2011 at one of the properties where we use 20% Pro Antler feed and Antler Builder mineral for supplemental nutrition. From that point on we were able to get hundreds of pics of this deer as he grew up utilizing our feed and minerals. The thing about Punkin was….. After he reached 4 years old (last year 2012) he would very rarely show up on the property during daylight hours. 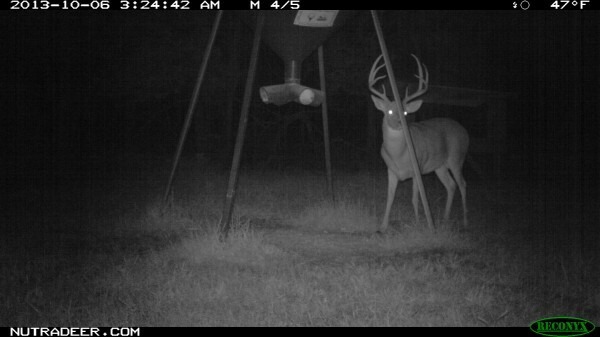 This his tendency became even worse as a fully mature 5 yr. old buck. We didn’t know if we would ever get a crack at him during daylight hours on this particular property. Our first snowfall and very cold temps in Oklahoma hit during the recent firearms season. Cold and snow usually means lots of deer activity at attractant sites so we were waiting for Punkin to show up at several locations in the timber, but it was a no go….We actually waited for the first week and a half of firearms season and still no Punkin…..
On Dec. 4th my oldest son put out 20 lbs of corn and sprayed it down with our new Power Spray attractant. Haydn sprayed the attractant on all the trees and vegetation around the site knowing the strong smell of the spray in a new strategic location might just be the ticket. Haydn had reviewed the wind direction for the next days forecast before setting the trap. That evening it got very cold with heavy snow falling and as predicted a strong wind was moving the smell of Power Spray directly into a heavy bedding area. 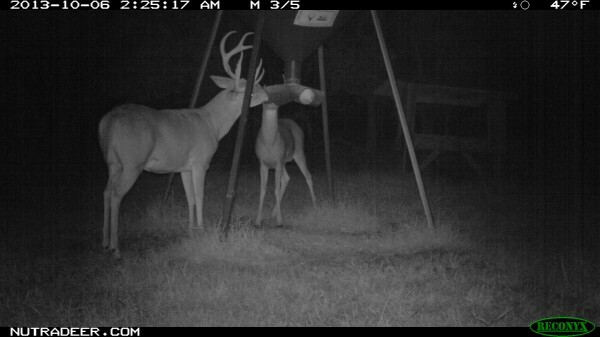 Around 3:30 that evening we noticed many deer showing up at Haydn’s new Power Spray site, and then it happened….Punkin showed up arond 4:30 wanting his fair share…. My Beautiful wife that everyone loves to pieces made a great shot on her very first deer! She was able to harvest Punkin at 100 yards (in heavy timber I might add) with her new 308 Savage. A perfect high shoulder shot and he was down. The rest is history – The 3 year saga is now complete and Patricia has her first deer mount for her office! I hope you enjoy the age and growth pics of Punkin from the 2011 to date. I have attached pics of him as a 3 year old in Dec. 2011, velvet pics of him in August 2012 when he was 4 yrs old and several 2013 pics as a fully mature 5 yr old buck. Please keep in mind that the part of Oklahoma where Punkin was harvested does not have any agriculture or fertile soils. Proudly we can report Punkin’s harvested weight is well above average and his antler mass is considerably heavier than the local deer herd. The Nutra Deer supplemental feed and mineral program continues to work wonders on our deer. 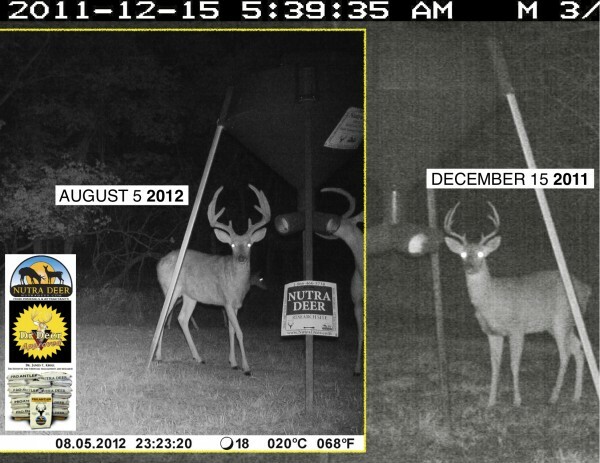 We see very noticeable gains in our deer every year now at this property. These gains were very minor in the past. We have also done some serious doe management and added a small pond to this property which helps the management process. This small property in NE OK. is never going to be Iowa, KS or IL but Nutra Deer is making a noticeable difference in a wild deer herd that needs supplemental nutrition. Nutra Deer can really help unlock the full genetic potential of wild deer. Hope you enjoy the story. We are all very proud of Patricia, Nutra Deer and this great White-tail Buck. This entry was posted in Uncategorized on December 19, 2013 by Jeff Williams.